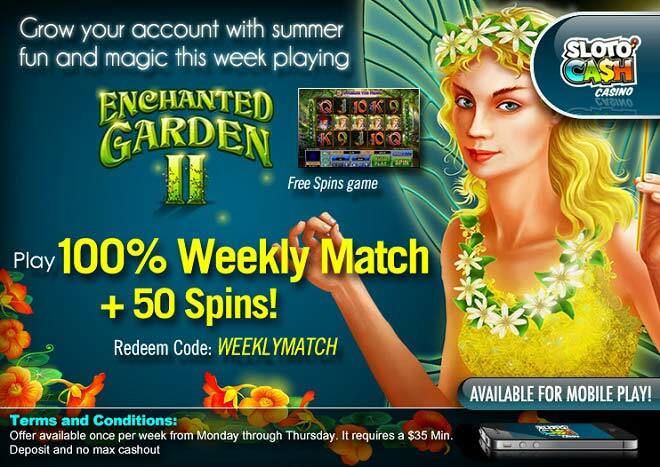 Summer is baking your Sloto account with scorching wins – and they’re about to get even hotter this August when you make a weekly $35 deposit to play with a 100% Match and 50 FREE Enchanted Garden II Spins! Your garden of wins has never been this beautiful – plant more winning opportunities throughout the month of August when you spin the reels of our new Enchanted Garden II slot where the Firefly Feature will have you winning up to 7 free games with all prizes tripled! Your summer garden will look even more successful this August as soon as you make your weekly $35 deposit and grow even more wins with a 100% Match and 50 FREE Spins!